What if you could improve and restore the volume, texture, and tone of your face, hands, and hair using nothing but your own body tissue? Thanks to the revolutionary ALMI procedure, this is actually possible! Dr. Besnoff and his team at Ultimate Image Cosmetic Medical Center are proud to now offer ALMI as a minimally invasive procedure that will take years off of your appearance in just one 45 minute appointment. Known as the “All Me – All Natural” rejuvenation procedure, ALMI rebuilds volume and structure where you need it most, using a combination of the body’s regenerative cells and fat tissue, all without going under the knife! 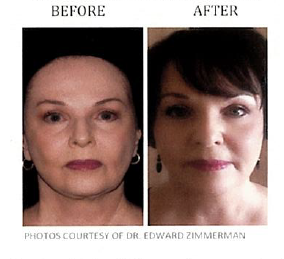 This incredible treatment generates results that may last up to one year. Hair loss affects more than half of men and women in their lifetimes, especially with age. Most baldness is marked by miniaturization of hair follicles, and studies have shown that the stem cells in the scalp struggle to convert into the progenitor cells required for follicle regrowth and cycling. ALMI addresses this issue by providing regenerative cells that can aide in the regeneration of hair follicles, halt hair loss, and encourage hair regrowth. In addition to supporting hair growth, ALMI is also a valuable treatment for facial rejuvenation. Collagen production inevitably slows as you get older, and by the age of 40 your skin has endured the impacts of 20 percent less collagen. This means that your skin can only be restored to a youthful state if volume and structure are rebuilt. ALMI utilizes a combination of the body’s regenerative cells and fat tissue to achieve this rejuvenation. If you’re ready to take advantage of this revolutionary skin and hair rejuvenation procedure to achieve all-natural results in just 45 minutes, call Ultimate Image Cosmetic Medical Center today. Dr. Besnoff will expertly use the ALMI procedure to restore your youth. Call (727) 799-7000 to make your appointment today!